What is Field Force Connect? Field Force Connect is an employee tracking and productivity app created to address common issues faced by companies that deploy field-based workforce. These issues include fake/unauthorized visits, slow updates from the field after client visits, tons of paperwork for field agents, increased back-office work, difficulty in tracking field agent location, and erroneous reporting from field agents among others. With Field Force Connect, companies have a user-friendly platform that enables them to track their field workers in real-time, instantly relay communication, requests, and work orders, and receive real-time updates before, during, and after client visits. For field-based workers, Field Force Connect simplify their tasks as they can immediately access client information, capture necessary details and send them to head office, and instantly file reports and updates using their mobile devices, and more. Field Force Connect provides you with a powerful, comprehensive field force management software that makes it easy to manage your field workforce and all related processes as well as maximize the efficiencies and enhance the productivity of your field-based workers. For your managers, Field Force Connect lets them track the real-time GPS location of each employee. This feature eliminates the instances of unauthorized and fake visits and ensures that your employees meet your clients at the right location and in time. Thus, it helps you and your employees secure your clients and potential customers and close more deals. Your managers can assign tasks to your employees on the fly and immediately provide the necessary information needed so they can accomplish their tasks in the most effective and efficient manner. This information ranges from the most viable route to client location, time and place of the meeting, and further details on the client among others. Field Force Connect provides your field workers with the capability to send reports and updates directly from the field in real time. This helps your managers to closely monitor sales performance and make quick decisions and relay instructions to field workers so they can close the sale, perform an upsell, recommend alternatives, and more. For employees, Field Force Connect lets them punch their attendance without having to go to the head office, saving them time and maximizing their attendance as they can immediately perform their tasks of the day. The software also eliminates the need for paper-based reports and documentation such as recording daily activities, entering client details, listing their work-related expenses, etc. What Problems Will Field Force Connect Solve? John is a salesperson in a manufacturing & distribution company, every day he has to visit many client sites to give a demo of their product. For this John needs to reach office first for his attendance and then he needs to visit client location. After every meeting, John has to call his manager to give the meeting details. This is a big problem John is facing, but after using FFC john can directly punch his attendance directly from the client location. Update his meeting details to his manager and track his daily activities. George is a sales manager and under him, 30 sales employees are working. Each one of his sales employees has to travel to different clients location every day. George is unable to track their location and unable to assign the important task. He has too much paperwork and maintains manual report. After using Field Force Connect George now can track his sales employees current location and immediately he can assign task through his phone. He can monitor every sales employee daily activity. Features- Geofencing, daily activities, roster plan, dynamic form. Sophia has her own jewelry business and the most important component of any company is to check the costs incurred and how they can minimize it and make a record of all products which is sold the most. With FFC, Sophia can easily track the expenses incurred by her field staff while they go about their work. After the meeting, if any of clients get interested in her products then sales employees can take orders directly from the site. Since each enterprise has specific business requirements, it is advisable for them to abstain from looking for a one-size-fits-all faultless software solution. Needless to say, it would be useless to try to find such an app even among popular software platforms. The intelligent thing to do would be to jot down the various essential aspects that require consideration such as required features, finances, skill levels of employees, company size etc. Then, you should do your research thoroughly. 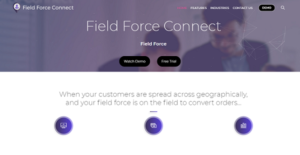 Read some Field Force Connect reviews and look into each of the other systems in your shortlist in detail. Such comprehensive research can make sure you weed out ill-fitting platforms and zero in on the solution that offers all the elements you require for business success. How Much Does Field Force Connect Cost? Field Force Connect pricing starts at $5-$15 per user per month. We realize that when you make a decision to buy Sales Force Automation Software it’s important not only to see how experts evaluate it in their reviews, but also to find out if the real people and companies that buy it are actually satisfied with the product. That’s why we’ve created our behavior-based Customer Satisfaction Algorithm™ that gathers customer reviews, comments and Field Force Connect reviews across a wide range of social media sites. The data is then presented in an easy to digest form showing how many people had positive and negative experience with Field Force Connect. With that information at hand you should be equipped to make an informed buying decision that you won’t regret. What are Field Force Connect pricing details? What integrations are available for Field Force Connect? If you need more information about Field Force Connect or you simply have a question let us know what you need and we’ll forward your request directly to the vendor.